Those people familiar with Derbyshire’s Peak District may be surprised to learn that the Duke of Rutland was once one of the county’s principal landowners. The title is historically linked with the imposing Belvoir Castle in Leicestershire but, at the beginning of the twentieth century, the Duke owned large swathes of land in Derbyshire – stretching from Hartington in the south towards the county border with Sheffield in the north. This was the Haddon Estate, named after their country seat at Haddon Hall, near Bakewell. The Manners, to give them their family name, deserted Haddon Hall in 1703 and it was an abandoned medieval manor house. 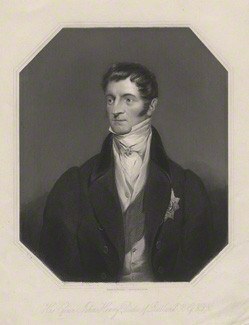 John Henry Manners, 5th Duke of Rutland, who built Longshaw Lodge. Portrait by Joseph Brown. The Derbyshire countryside still provided temptation for the Duke of Rutland. With thousands of acres of wild moorland at his disposal the area was prime grouse shooting. Purchased in the 1820s, the peerage exploited the riches that the uplands offered. Around 1827, John Henry Manners (1778-1857), 5th Duke of Rutland, wanting to make his shooting parties more comfortable, built a ‘shooting box’, close to the moors, but in the shelter of the Derwent Valley. Longshaw Lodge was ideally placed, with Sheffield just 7 miles north and Chesterfield a similar distance to the east. Haddon Hall, and the market town of Bakewell, lay to the south, while another Manners’ property, the Tudor mansion at Stanton Woodhouse, was within easy reach at Rowlsey. While the original ‘shooting box’ may have been modest the late nineteenth century additions turned Longshaw Lodge into an elegant aristocratic country house. Nowadays, the appearance is odd in that the irregular building has five different gables and, despite being two-storeys throughout, is of differing heights. Typically made of ashlar and coursed square gritstone it is defined with a tall four-storey square tower at the rear with embattled parapet. Adjacent to the range is a chapel made of regularly coarsed gritstone with ashlar dressings and a stone slate roof. Behind the lodge complex is a former ice house, circular in shape, now dark and empty, and covered with coarse grass. During the Duke of Rutland’s time the building was offset with fine ornamental gardens and private walks and driveways across the estate. Rhododendrons were planted close to the building to provide flowering as well as cover for game birds. Elsewhere, a series of nine smaller lodges were built to house the Duke’s many gamekeepers. The Longshaw Moors provided happy hunting grounds. The shooting area was vast – ‘as large as Lambeth, Greenwich and Kensington combined’. Longshaw Lodge would favour visits from visiting aristocrats – the Duke of Devonshire and the Duke of Wellington were guests – and the shooting parties were well tailored. The house had 28 bed and dressing rooms, two bathrooms, a suite of reception rooms and, by the early twentieth century, electric light, a good water supply and central heating. 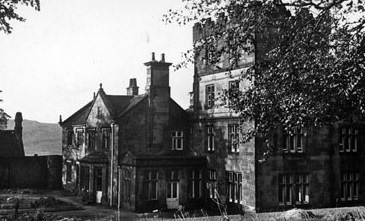 Longshaw Lodge as shown in the sale prospectus of 1927. During World War 1 the house would play an important role. The Military Base Hospital, operated by the Territorial Force Medical Services in Sheffield, at the Teacher Training College on Ecclesall Road, was under immense pressure with an unremitting stream of sick and wounded soldiers. An appeal was made for overspill amenities and, in February 1915, the Duke of Rutland donated the use of the lodge for convalescing patients. Wounded men would arrive at Sheffield Station before being taken to the Base Hospital. As soon as their health allowed they were moved to Base Hospital Sections. Longshaw’s rural scenery provided a restful setting for those damaged by the war. In time over 60 soldiers, from Britain, Australia, New Zealand and Canada, would be accommodated. From here they were allowed to roam the moorland, sail boats on the lake and visit local houses, such as Haddon Hall and Eyam Hall. Henry John Brinsley Manners (1852-1925), the 8th Duke of Rutland, still visited during the war. He enjoyed the shooting parties but, for many years, rented the estate to Sir Thomas Isaac Birkin (1831-1922), the lace manufacturer, director of the Great Northern Railway and the Mercantile Steamship Company. In her book, ‘The Secret Rooms’, the writer Catherine Bailey reveals letters pertaining to the Duke’s son and heir, John Henry Montagu Manners (1886-1940), who visited Longshaw during hostilities. The timings of his visits offered mysteries that he fought to hide many years later. By the 1920s the Duke of Rutland estate, like many others, faced a cash crisis. The Duke had rolled over debts incurred when Belvoir Castle was built at the beginning of the nineteenth century. Confounding matters was the sudden decline in agricultural income and higher taxation imposed after the Great War. In 1920, the 8th Duke of Rutland, was forced to sell 13,000 acres of his beloved Belvoir estate as well as 15,000 acres around Bakewell and Ilkeston. The sales raised £1.5m and much of this was spent on the rebuilding of Haddon Hall which was handed to his heir the following year along with the rest of the Derbyshire estate. Following the death of the 8thDuke of Rutland, in 1925, the estate faced crippling death duties. The 9th Duke, intent on finishing Haddon Hall, had decisions to make. The restoration of Haddon Hall was consuming money that was not readily available. 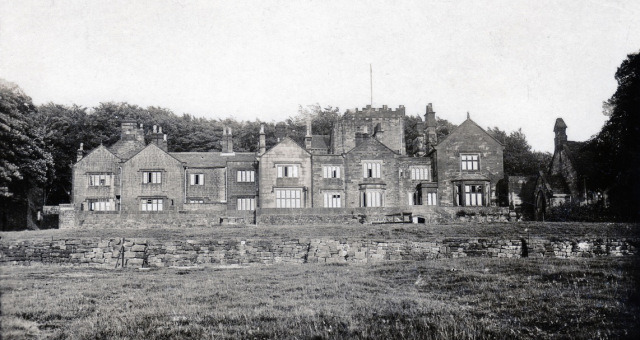 In March 1927, with the Duke residing at Haddon Hall, he put the whole of the Longshaw Lodge estate up for sale. The sale, organised by Messrs John Wood & Co of Grosvenor Square, comprised 11, 533 acres, some 18 square miles. The announcement created much excitement but it was thought unlikely that buyers would want such a large estate. It was envisaged that the land would be divided into smaller lots. Details of the sale were complicated but by June the arrangements were complete. The centrepiece of the sale was Longshaw Lodge deemed suitable for conversion for residential purposes as a school, institution or hotel. With this came 747 acres of park like land, woodland and moorland. 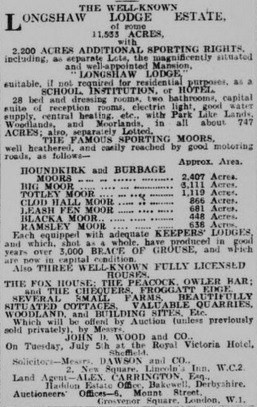 The famous sporting moors were listed in separate lots. The largest was Big Moor comprising of 3,111 acres. Also available were the Houndkirk and Burbage Moors, Totley Moor, Clod Hall Moor, Leash Fen Moor, Blacka Moor and Ramsley Moor – in all 6,359 acres. Each came equipped with a Keeper’s Lodge and, according to the advertisements, when shot as a whole produced 3,000 brace of grouse. Also included in the sale were three licensed houses – The Fox House, The Peacock at Owler Bar and The Chequers at Froggatt Edge. Seven small farms were listed as were cottages, quarries and building sites. The auction date was set for Tuesday July 5th, 1927, at the Royal Victoria Hotel in Sheffield. Though the date was agreed the Duke of Rutland’s agents were busy negotiating private sales. Just days after the announcement there were claims that Sheffield Corporation were showing an interest in one of the lots. The reason for their attention remained secret but the assumption was that Longshaw could satisfy the increasing demand for housing. The sale prospectus had suggested that the area might be suitable for a golf course and building development. The idea was scandalous, if not ridiculous, considering the city was 7 miles away, across the border, in Yorkshire. In fact, Sheffield Corporation were considering Longshaw, and it wasn’t housing they had in mind, but what the land already provided. Sheffield was a city with an increasing population. The Corporation already supplied 2½ million gallons of water daily and were obligated to supply a further 2 million gallons to outside districts. They had a daily reserve of 7¼ million gallons which was deemed small in comparison with other big cities. The elders were concerned that this reserve would be expended within 15 years as all other sources of supply had been exhausted. The Longshaw Lodge Estate, with its huge moorland and water run-off, provided the solution. Then, as now, the Sheffield Corporation weren’t cash rich and would need to borrow the £35,000 needed to buy 3,210 acres, covering 5½ square miles. The purchase, 12 of the 48 available lots, would take in Longshaw Lodge and 747 acres, overlooking the heather and crags of Hathersage Moor and the summits of Higgar Tor, Carl’s Wark and the Burbage, Hathersage, Bingham, Houndkirk and Lady Canning’s Moors, together with two quarries. Much of the land had the adaptability for water supply. To offset the loan the Corporation had already negotiated a deal with a local committee on behalf of the National Trust to buy the 747 acres around Longshaw Lodge. This would secure beautiful moorland and woodland for the preservation of natural beauty. A Ministry of Health inquiry was held in Sheffield, the day before the auction, and undertakings were given that no other buildings, other than those in connection with water supply, would be erected on the length of the roadway between Toad’s Mouth and the Surprise View. Nonetheless, the inquiry was told that the public would not be able to roam over Burbage Brook, Burbage Moor and Houndkirk as this would be made private for the purpose of the undertaking. As a result of the auction more than half of the Duke of Rutland’s estate had been sold. Baslow Urban District Council bought 394 acres of Eaglestone Flat Moor for £3,000 to fortify their own water supply. Clod Hall and East Moor, some 868 acres, were purchased by the Duke of Devonshire and absorbed into the Chatsworth Estate. However, some of the larger moors still remained in the Duke of Rutland’s hands. Longshaw Lodge was now in the hands of Sheffield Corporation but the handover to the National Trust was more complex. The sale necessitated £14,000 be raised by a group of Sheffield people. In 1924, Ethel Gallimore had formed the Sheffield Association for the Protection of Local Scenery with 12 ‘like-minded’ people. They met at Endcliffe Vale House, the home of her mother Mrs T.W. Ward, in Sheffield. In 1927 they were invited to become the Peak District branch for the Council for the Preservation of Rural England. One of their first tasks was to launch a joint appeal with the Council for Social Services to raise the money needed for the purchase of Longshaw Lodge. The appeal was also made in Manchester with the undertaking that a portion of the famous Surprise View on the Hathersage Road being dedicated if the response was satisfactory. Co-ordinated by the Council for the Preservation of Rural England, the Longshaw land first opened to the public on Easter Weekend, 1928. It was patrolled by volunteer wardens with working parties from rambling clubs helping to maintain the estate. 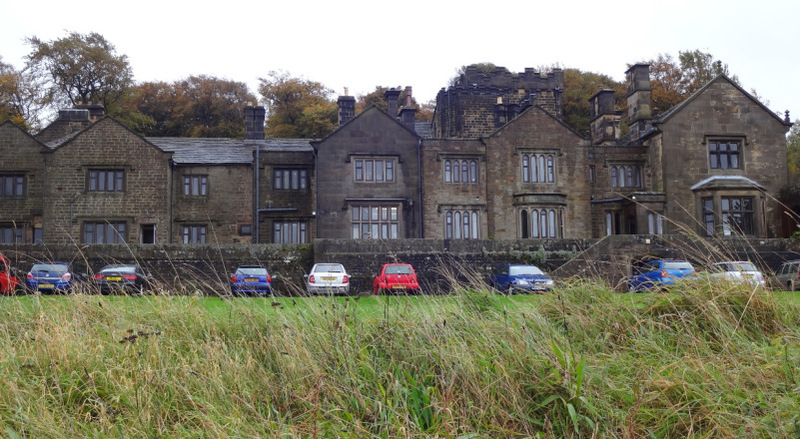 Meanwhile, speculation continued as to the future use of Longshaw Lodge itself. In early 1928 the building was considered for conversion into a convalescent home. The successful conversion of The Hayes, at Swanwick, into a conference centre and summer school, raised the idea that Longshaw Lodge might be suitable for similar use. However, in October it was announced that the building had been leased to the Holiday Fellowship, an offshoot of the Co-Operative Holidays Association, for a period of 21 years. The Holiday Fellowship had been conceived by Thomas Arthur Leonard (1864-1948) with a group of friends at Matlock Bath in 1914. Their purpose being to “organise holidaymaking, promote the healthy enjoyment of leisure, to encourage the love of the outdoors and to promote social and international friendship”. This provided basic accessible walking holidays and Longshaw Lodge would be used as a guest house and a centre for weekend conferences as well as providing camping facilities for boy scouts and similar organisations. Soon, an army of workmen were busily converting Longshaw Lodge from ‘a cold bleak-looking place into a warm holiday home’. “Here, the tired workers of the industrial towns will be able to enjoy the invigorating air of the moorland”. On Friday 29th March 1929, Longshaw Lodge was opened as a guest house by Mr H. J. Stone, General Secretary of the Holiday Fellowship Ltd. It was announced that the adjoining private chapel would open later in the year for Sunday morning services. In the summer the Derby Evening Telegraph reported that “a congregation dressed in walking kit attended the private chapel and the lesson was read by a man wearing a cricket shirt – open at the neck”. With Longshaw Lodge secure the transfer to the National Trust took three years to complete. The appeal had raised over £11,324, with the Sheffield Trust making a sizeable contribution. The money required was less than originally forecast and the remainder of the balance (£570) was met by the National Trust itself. 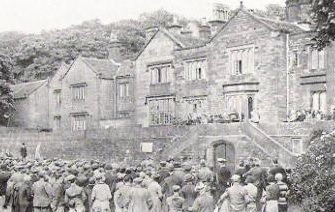 On Saturday June 27th, 1931, at 4.15pm, a large crowd gathered outside Longshaw Lodge. It comprised the many subscribers to the Longshaw Fund as well as curious onlookers who had travelled from Sheffield, Manchester and Derbyshire. Here, Professor George Macaulay Trevelyan, the well-known historian, who had himself given large areas of scenery to the nation, accepted the deeds on behalf of the National Trust. Speeches were made from the terrace and amplified to the gathering below. This was the first open countryside acquired by the National Trust in the Peak District and proved extremely popular with ramblers. From here on the National Trust would maintain a close association with ramblers and working parties from Sheffield, such as the Clarion Ramblers, would help maintain the estate. Longshaw Lodge would continue to be a popular guest house with the Holiday Fellowship for many years. In the early 1930s they opened a café for the benefit of the public and eventually ended their lease in 1960. Two years later it was converted into residential flats with an annual rent of £200. Nowadays the National Trust preserves the natural beauty of the estate as well as offering a visitor and discovery centre. Longshaw Lodge remains private accommodation but the rest of the estate provides open access for the public. One of the former shooting lodges, White Edge Lodge, is now a holiday cottage set in bleak but beautiful surroundings. The whole estate is within the Peak District National Park, created 20 years after the National Trust purchase. It remains within Derbyshire but straddles the border with Yorkshire (as a result of the initial Sheffield Corporation acquisition). Further information derived from ‘English Landed Society in the 20th Century’ by Madeleine Beard (1989), Routledge London;‘Country House Society’ by Pamela Horn (2013), Amberley. Additional information from the newspaper archives of the Morning Post, Derby Daily Telegraph, Dundee Courier, Dundee Evening Telegraph, Hull Daily Mail and the Yorkshire Post and Leeds Intelligencer.